Naradha needed some help to accomplish his mission. He then went to the banks of the River Ganga, where several sages were performing a yagna. 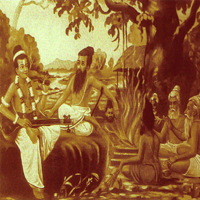 The sages could not decide as to who was worthy of the fruit of their yagna. Sage Bhrigu decided to solve the problem by examinig the Hindu trinity -Lord Brahma the creator , Lord vishnu the protector and Lord Shiva the destroyer. Sage Bhrigu visited satyalokam, the abode of Lord Brahma. Infuriated by his indifferent behaviour, sage Bhrigu cursed Him saying that He would have no shrine on earth to dwell in. When Lord Brahma was creating the universe, one of His creations was Shatarupa (a female deity with a hundred beautiful forms). Her beauty was such that lord Brahma Himself was infatuated by her. Shatarupa tried to avoid Lord Brahma's gaze by moving away but she did not succeed as Lord Brahma developed five heads, and Hid gaze, followed her wherever she went. Lord shiva decided that it was wrong of Lord Brahma to be obsessed with her as having created her, she was like a daughter to Him. Lord Shiva cut off Lord Brahma's uppermost head and directed that there be no proper worship fo the 'Unholy' Lord . From that time on, Lord Brahma took to reciting the four Vedas – each of His four heads representing a Veda . Sage Bhrigu then visited Lord Shiva's abode – Kailasam. Lord Shiva was absorbed in the Kailasam. Lord Shiva was absorbed in the company of His consort- Parvati Devi, and was quite indigant at Sage Bhrigu's interruption. Sage Bhrigu cursed Lord Shiva by saying that He would be worshipped on earth, only in the form of a Lingam. Finally, when Sage Bhrigu reached Vaikuntam, the abode of the Lord Vishnu, he found the Lord reclining on Adisesha completely engrossed with His consort, Goddess Mahalakshmi, enraged at being ignored, sage Bhrigu kicked Lord Vishnu on his chest. Lord Vishnu immediately got up and apologised to Sage Bhrigu for His behaviour. As He massaged his foot in apology. He removed the Sage's third eye, that gave him the power to defy the Devas. Pleased by Lord Vishnu's act, Sage Bhrigu decided that the yagna was to be dedicated to Lord Vishnu. In the meantime, Goddess mahalakshmi, who felt humiliated and angry towards Sage Bhrigu for having kicked her husband, departed from Vaikuntam and made her way to Karavirapura (now Kolhapur in the state of Maharashtra) where she performed penance and meditation.Unable to bear the loneliness caused by the separation , the Lod made His way to earth in search of Goddess Mahalakshmi, but in vain. Tired after searching endlessly, the Lord reached Tirumala and entered the ant-hill beneath the tamarind tree on the souther bank of Swami pushkarini. He lived there for thousands of years. It is in the reign of a Chola King that the story unfolds futher. Goddess Mahalakshmi who still lived in Karavirapura knew instinctively that Her Lord had left Vaikuntam and was living in an ant-hill in Tirumala. Regretting having left Him, Goddess Mahalakshmi in the form of a cowhedess sold Lord Brahma in the form of a cow and Lord Shiva in the form of a calf to the Chola Queen. Lord Brahma and Lord Shiva took these forms to look after Lord Vishnu so that Goddess Mahalakhmi would no longer need to worry about His well-being. Everyday the cow and the calf accompanied the Chola King's herd of two thousand cattle to graze on the hillside. Unnoticed, the cow would empty its milk on the ant hill. For Lord Vishnu to drink. When the Chola Queen found out that the cow was not yielding any milk, she took the cowherd to task. The next day the cowherd followed the cow to the ant-hill and watched as it emptied its milk there. The cowherd's anger knew no bounds. He was furious and threw his axe at the cow, but Lord Vishnu took the blow and saved the cow. Shocked at what he had done, the cowherd fainted. The cow immediately ran to the place and returned to the scene of the incident along with the King. The King was punished for the act of his cowherd by Lord Vishnu. He was cursed to be a demon. The King prayed for mercy and Lord Vishnu softened and told him that he would have to suffer the curse, but then would be reborn as Akasa Raja, whose daughter Padmavati would be married to the Lord Himself. The cowherd was rewarded with the boon that his descendents (Yadavas ) would have the first glimpse of the Lord everyday in Tirumala. Brihaspathi prescribed certain herbs to cure the wound on Lord Vishnu's head. While searching the hills for those herbs, lord Vishnu met Varaha Swami (the boar avatar of Lord Vishnu) and requested him for a place to stay till the end of Kali Yuga. Varaha Swami obliged Him on the condition that Lord Vishnu would pay the price for the land. He marked out the land and even sent Vakula Devi to look after Him. In return, Varaha Swami would receive the first prayer – puja and the offering of food – naivedyam, from Lord Vishnu's devotees. Vakula Devi was the incarnation of Sri Krishna's mother, Yashoda. Yashoda was saddened by the fact that she was not blessed to witness the marriage of Sri Krishna with Rukmini. That is how she was privileged to be close to the Lord once agin a Vakula Devi. The legend countinues . The cused Chola King (having paid his price as a demon) was reborn as Akasa Raja, the ruler of Tondamandalam. Although Akasa Raja had a brother Tondaman, he had no heirs. A decision was made to have a grand puja. Whilst ploughing the fields in its preparation a thousand petalled lotus was unearthed. A beautiful infant girl cradled amoungst the lotus petals surprised and thrilled him. He carried the child to his palace and presented her to his Queen – Dharani Devi. They named their daughter Padmavati after the lotus that she was found in. Padmavati grew into a beautiful princess. Sage Narada, on one of him many visits to the palace enlightened Padmavati of her destiny – she would soon become the spouse of Lord Vishnu himself. The other half of the legend unfolds. Lord Vishnu whilst hunting in the forest surrounding the hills, pursues a wild elephannt. He enters the same garden as Princess Padmavati and her companions. When the Lord sees the enchanting princes, He falls in love with her.Upon returning home, He confides in Vakula Devi. While narrating the day's experiences, He also tells her about His promise make to Vedavati in His previous birth as Rama. Lord Vishnu had promised to marry Vedavati in her next birth and now she was here as Padmavati. In the Ramayanam when Ravana was about to cary away Sita in the absence of Rama and Lakshmana, Lord Agni appeared and offered Vedavati to Ravana as the real Sita. Ravana was tricked in to thinking that Vedavati was Sita while the real Sita stayed in Agni's house. After Ravana's destruction Vedavati faces rejection from Rama. She then gives herself up to the sacrificial flames of the fire. Agni, then offers the real Sita to Rama. Rama is enlightened by Sita, regarding Vedavati's endurance of Ravana's torture for ten months in lanka. He then promises to wed Vadavati in her next birth when she would be reborn as a padmavati. Lord Vishnu's proposal of marriage to the Princess Padmavati is yet another interesting pard of the legend. Vakula Devi offered to take the proposal to Akasa Raja on Lord Vishnu's behalf. However Lord Vishnu was anxious and doubtful as to whether Vakula Devi would return successful. So then, He assumed the form of a lady fortune-teller and informed Queen Dharani Devi that Princess padmavati would soon marry lady bearing the proposal on behalf of the Lord.The events unfolded as planned and Akasa Raja requested the palace purohits to fix a mahurtam for the marriage. Anxiety and concern about raising the substantial sum for the grand wedding ceremony led Vakula Devi and Lord Vishnu to seek the advice of Lord Brahma and Lord Shiva. They suggested Kubera's help in this regard. An agreement was reached wherein Kubera's loan to the Lord would be repaid with interest. In fact, it is believed that all the offerings in the hundi, to this day , form part of the repayment to Kubera. The wedding ceremony was blessed with the presence of the Devas. Amongst the traditional festivities and rituals, the presentation of a diamond studded crown to Lord Vishnu by Akasa Raja enhanced the grandeur of the occasion furthermore. To this day the crown adorns the idol of Lord Venkateswara Swami in Tirumala.